St Johns loves nothing more than a reason to bring the community together and celebrate. Play your part and drop off a gift before the 19th of December! We have teamed up with Cash for Kids and will be supporting their Mission Christmas campaign to ensure that the thousands of children living in poverty up and down the UK don’t wake up on Christmas morning with no presents. We have a big drop off point at our Events Unit. Find the unit on the St Johns Lane entrance to the centre – no.74 on the store map. Making Christmas easier with light night opening! We will be open until 7 pm from 19th November-18th December, and 5 pm on Sundays! We’ll be open until 5 pm on Christmas Eve – giving all you last-minute shoppers a chance to spread some Christmas cheer! We will be closed on Christmas Day and New Year’s Day, but open until 5 pm on Boxing Day and New Year’s Eve, and open 28th and 29th December until 6 pm. Pick up your Santa Dash suit at St Johns! Yes, once again thousands of Santas will be turning the streets of the City Centre into red and blue. For those of you braving the Santa Dash, you can collect your Santa Suit from now to the 1st of December at our Events Unit; no.74 on the store map. 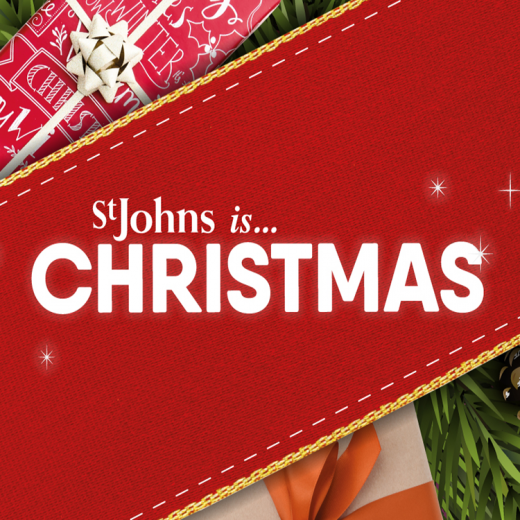 St Johns will also be running a special competition in the 24 days before Christmas – keep your eye on our Facebook page to be in with the chance of winning 1 of 24 fabulous prizes. The prizes will all be donations from our fantastic stores and partners, ranging from an Armani perfume to a 3-course dinner & bottle of red or white wine in “The view” restaurant equivalent to the value of £150! From everybody at St Johns, Merry Christmas and let the fun begin! St Johns Shopping Centre is turning purple for the day! St Johns teams up with Cash for Kids!